If you are to listen to Abe without having to look at her, you would think that she is a Japanese girl. But no, she's but a bird. Abe is the pet bird of a woman in Japan. Obviously, Abe has been taught to mimic Japanese words and phrases. But what makes this amazing is the sound of her voice. It's almost as if it's coming from a real human being. Abe is a Common Myna bird. 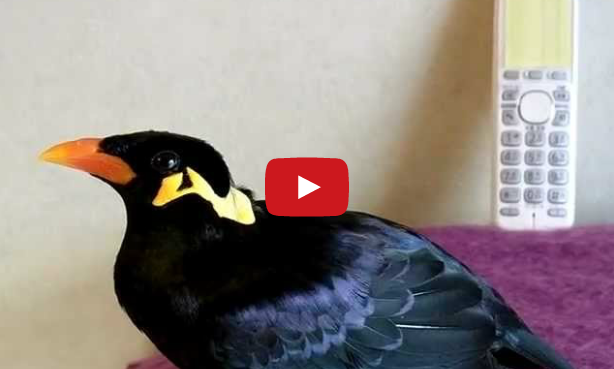 The Common Myna is native to Asia and they've become popular as cage birds and pets because of their singing and speaking capabilities. They can make several bird calls like croaks, squawks, chirps, clicks, whistles, and growls. This versatility makes it almost very easy for them to mimic sounds by humans and other animals.